I did not set out to write a book about dates and times and policy and what went right and what went wrong. I wanted to capture, in a very visceral and emotional way, the time that I lived in — beginning in 1998 in Afghanistan, all the way to when I left Iraq in late 2006. That was a moment in time and these were the things that I saw. Every war has its classic volume of war correspondence. As historians or just interested lay-readers, we have a tendency to assume that these famous tomes exemplify how everyone experienced their contemporary war. Often, we're mistaken to do so, superimposing a coherent, edited narrative on what was then informational chaos. 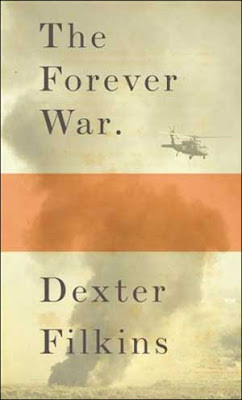 What makes Dexter Filkins' The Forever War so good in this respect is that it seems to aim for thoughtful lack of coherence, deliberately undermining a certain overriding story even to the point that it's probably best not to think of it as war correspondence at all. That isn't to say that "war correspondent" wasn't Filkins' job. First for the Los Angeles Times and later for the New York Times, he covered Afghanistan and Iraq from 1998-2007, watching the first country succumb to Taliban control and later American forces and the second country to American invasion, sectarian strife and later hints of the Sunni Awakening. Much of the content of this book is taken from pieces written for both papers, which explains the tight pacing, excellent short character profiles and beautiful economy of Filkins' prose. The trouble with most war correspondences is that they both rely on the episodic nature of day-to-day reporting and also betray it. Pieces filed on a random day that later contradict what becomes known as the overall and "correct" story of the war and who won it get tossed out before the first draft. Instead of daily snapshots occasionally being wrong, focusing on the wrong people or events entirely, we as readers often encounter this episodic tale that's presented as if there was always an understood outcome. Filkins plays with this by including snapshots that appear irrelevant to the driving theme of the day, offering the strange as counterpoint to the staged, seeming to delight in the very human tendency to go off-script pretty much constantly and whenever possible. But he's not doing this to be flip or because he can't make head or tail of the dominant themes of his time. Instead, seemingly bizarre and unnecessary vignettes open up the ideas later explored via conflicting details. Contradictory stories are there because contradictory stories were there; what makes Filkins' book good is knowing how to put the narrative at loggerheads with itself for a purpose. So we came up with this great way to search villages," the captain told me. "We got this girl here in the company—blonde, she's hot," the captain said. "This is when we were up in Mosul. We had to search all these villages for guns. Those villages are awful up there. So we went into this village and put the blonde girl we had on top of one of the Bradleys. We just rolled in and put her up there and took off her helmet and let her hair spill out. "So she's standing there on top of the Bradley, blonde hair and everything, and we called out on the loudspeaker, 'This woman is for sale. Blonde woman for sale!' And I'll be damned if every Iraqi male in that village wasn't gathered around the Bradley in about two minutes. You know the Iraqis are crazy for blondes. Crazy for them. They don't have any here." The captain started eating a strawberry Pop-Tart. "So she's standing up there on the Bradley, and we'd have an auction. Highest bid gets the blonde! They're going crazy, the Iraqis, offering their goats, trucks, all their money. Children. Everything. I'm standing up there, saying, 'Nope, not enough! Not enough!' And they're bidding more. One of the guys had his hands on the big machine gun just in case it got out of control. The Iraqis were wild. Just staring at her. "So we're up there having the auction, and during the auction I sent our guys around back into the houses to look for guns. We're having the auction and all the Iraqis are at the auction yelling for the blonde while our guys are collecting the guns from the houses. It was totally quiet in the houses, just the women in there. We got a huge pile of guns. Searched the whole village, no problem." What happened with the auction? I asked him. "We just shut it down. Told them the bids weren't high enough." The captain laughed. "The Iraqis were pissed off but it was okay." I was laughing and the captain got quiet for a second. Throughout the book, Filkins inserts italicized-titled anecdotes like this to both vivify and unpack important factors in the conflicts he subsequently describes. The Blonde, as a stand-alone story, is completely satisfying. It's interesting, unexpected and the sort of earthy soldier fare that Ernie Pyle might have written in a more liberated age. But it also perfectly encapsulates the ideological and organizational difficulties involved in prosecuting the Iraq War. Consider: this is counter-insurgency warfare at its best. These soldiers used their own ingenuity and initiative to completely disarm an entire village without loss of life, injury, property damage or inconvenience. They've, at least temporarily, demilitarized this town. However — and this is a point that Filkins doesn't belabor but rather lets the ensuing text elaborate — it's dangerous because that kind of situational ingenuity is impossible to control. The next few dozen pages profile a Colonel whose own initiative in developing counter-insurgency tactics resulted in a perfectly peaceful but draconian PR nightmare. The man was a mustache and a few rules of war short of being a Hussein cousin. But his inspirations came from the same life-preserving impulses. What both these anecdotes point up, then, is that national counter-insurgency policy is often stupidly ineffective, because counter-insurgency policies are best established on the ground. Yet, at the same time, making your national policy one of deferring to local commanders is equally undesirable, because military effectiveness is often politically nightmarish. The case of the draconian colonel is easy enough to understand. His practice of liberating and democratizing a locality by turning it into an ad hoc military-dictatorial fiefdom doubtless spared many lives, but it did so at the expense of turning America's policy of democratization on its ear. The case of The Blonde is no less politically dire. For example, you have a white woman being offered up as a slave. Given that our national Iraqi policy featured an insistence that the Iraqis abjure sharia in favor of western concepts of sexual equality, that unit's brilliant improvisation required trading in and enforcing the same tropes of ownership and submission we were trying to avoid. At the same time, those soldiers trade at least implicitly in the conception of Iraqi men as backward, dominant, acquisitive and abusive people who — and this is also important — are stupid enough to be fooled repeatedly. In sum, the very things that make it effective also make it exactly what we don't want to do. We don't want to compromise the messages that women are equal to men and that the Iraqi people are civil, intelligent, respectful and capable of fair governance of all their citizens. Thus, we have to repudiate methods that result in optimal effectiveness and zero casualties because they are a political muddle. Instead, we have to embrace more potentially violent, less effective but more intellectually and socially consistent methods. To a military theorist, it's maddening: mandating tactics on the basis of national ideological necessity destroys local initiative and erodes advantage. But, at the same time, local successes and exploitation of advantage can destroy the overall message they serve to advance. Writing out arguments like this is important because Filkins doesn't. They arise naturally from the scenes he describes, but he, almost without exception, never puts the events he describes into a forceful argumentative framework. For one, it's a fruitless labor: every other author and theorist has already done so, and most of them will probably be wrong. Better to arrange the conflicting evidence in a digestible way that leaves the reader to look for the connections and disconnections that best characterize the terrible and sometimes mortal confusion with which everyone involved had to cope. I suspect Filkins also foregoes that narrative structure because telling stories within it naturally leads us to the same conclusions and morals we've been led to via other stories. Once you've drawn a moral lesson from one set of circumstances, it becomes too easy to try to find your way back to it again in other circumstances. Early conclusions feel more comfortable to return to; we feed a confirmation bias while dismissing contradictory anecdote. Of course, what's described above are just snapshots, and extrapolating something as grand as a national ethnic or religious policy from the incidents Filkins perceives is probably a mistake. This, I think, is probably the message he most wants to impart. Those sitting at a remove and looking at the big picture — the policymakers in the Green Zone — often can get things comically or heartbreakingly wrong. Similarly, anyone on the ground experiences a neverending succession of up-close vignettes from which no sense of whole can be gleaned. Both people are doubtless aware that a reasonable picture of Iraq and Afghanistan meets somewhere between each other's depth of field, but each is perhaps too wedded to or moved or beguiled by the immediacy of his own perspective. This last concept undermines a view of The Forever War as purely a war correspondence. As the book progresses, Filkins increasingly echoes attitudes shared by so many who wrote of the First World War: their divorce from policymakers, their bafflement at the rear-echelon's blinkered Big Picture perspective — their intense kinship with fellow suffering individuals, kinship in minutiae, in the profundity of insignificant movements of earth. Filkins' book certainly begins as war correspondence, but it ends in something like a departure from the self. It wasn't until reaching the final third of the book that the similarities between The Forever War and Robert Graves' Good-Bye to All That arose strikingly and, at least to my mind, unmistakably. As the book goes on, it becomes evident that Filkins has more in mind than simply retreading his old work while glossing it with editorial and behind-the-scenes content that could never have made it into the paper. The resolution and precision of American forces in Afghanistan followed on the heels by a story of disorganized pre-battle negotiation between two Afghan forces might at first sound like two stories filed on two different days. Instead, he's playing with counterpoint again in that offhand and seductively simple way. In this instance, Filkins introduces one of the few running themes in his book: that, of everyone toting around arms in Afghanistan and Iraq, the two groups more enthusiastic about fighting than anyone else are both foreign: the Arabs and the Americans, one group invoking the Caliphate, the other incanting Freedom and Democracy, each less concerned than the natives about the effects of their struggles on their surroundings. Suddenly the existence of a soldier who escapes Taliban lines one day only to capture his former comrades while cooperating with the Americans explains itself: go where the stability lies; begin, as soon as possible, the transition to having all of these people leave us alone. Filkins hints at much the same motivation for the "Sunni Awakening" in Iraq. Not democracy, not liberty, not equality of peoples and religions — nothing so godawful noble as that — just an absence of the forever war. The Sunni insurgency tried and failed to reassert, without Saddam, the cultural and military hegemony they enjoyed under him and, when it failed, figured any bargain struck that created an absence of violence was better than any other arrangement with it. This exhaustion and the profound significance of seemingly trivial changes witnessed up close echoes Graves' memoir particularly as the sense of personal collapse and fear seep into Filkins himself. Just as he can't extrapolate a picture of the larger conflict from these immediate interactions, he knows that the Big Picture issued from Washington or the Green Zone makes almost no allowance for the deviations and unaccounted variables that make up so much of his story. Everything has so much meaning and is yet so frightening — or, worse, maybe futile. 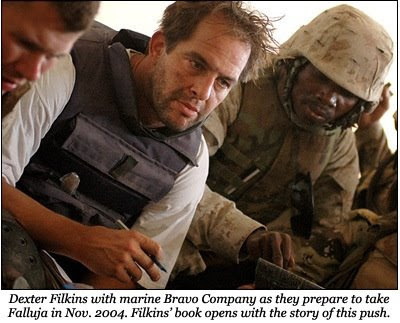 Filkins isn't quite as negative as this; he tries to keep the sense of absurd horror away and merely report, which includes giving faithful space and credence to the positivity and purposefulness of the marines with which he travels. But it's this effort that transforms the book from correspondence and succession of interviews and anecdotes to the memoir of someone who's losing faith, energy and security to danger, narrowing roads, cold faces, snipers. His attempt to carve out some small territory of his own control against the constricting pressures of the war reads like a Gravesean grasp for his own identity. Graves wrote Good-Bye to All That to pay final respects to the ideals of European civilization that the First World War butchered, to dead comrades and to his soldiering, but mostly to the man he was. The memoir was as much the story of a place as it was the story of a person who simply wasn't there anymore. The effects of nearly a decade of conflict, of Afghanistan and Iraq, seem to effect the same sad change in Filkins. By the end of The Forever War, he appears to offer the same farewell to himself. George Packer's book is still the best stand-alone look at the war available. Deftly handles American policy from the creation of the Project for a New American Century, 9/11, planning for war, interdepartmental squabbling and finally invasion, to the lives of Iraqi translators, the Balkanization of Baghdad into sectarian fiefdoms, American adaptation to counter-insurgency warfare and finally the response back on the home front. Moreover, those who can't stomach the politicization of the Iraq War discussion will find some community with Packer's professed political agnosticism. He's not an anti-war leftist, and his wrestling with his feelings about the war will doubtless reflect the troubles many readers have in appreciating its ramifications. Also, if you were to look for any two volume overview of the war, this and Filkins' book go neatly hand-in-hand. Rajiv Chandrasekaran's look at the political organization of occupied Iraq provides a seemingly endless string of amusing stories and fresh horrors: all Iraqi securities trade shut down to create a conservative dreamland version of the New York Stock Exchange; administrators and planners back in the U.S. grilled and culled based on who they voted for in 2000 and whether they oppose abortion; vital national infrastructural projects handed over to campaign staffers as a reward for their work in 2000, irrespective of significant qualification. While Filkins provides a personalized overview of Iraq and Packer aims at something like a broad survey, Chandrasekaran focuses closely on the political decisions in Washington and how politics shaped the Iraqi government and the war. A mark off because while Chandrasekaran tells many interesting stories, he doesn't bundle them up into nearly as cohesive a narrative as possible (although in fairness to him, he was covering a governing body that itself couldn't bundle facts into a narrative). Moreover, many of his quotes are anonymous, which gives it the feel of a kind of a loosely aggregated narrative of overheard snippets. Thomas Ricks' analysis of US strategy before and during the war serves as the natural companion piece to Chandrasekaran's political look. A mark off both for the repetition of many already well-known facts about the lead up to the war and analyses of that period (Ricks is very good about re-presenting salient observations in a more persuasive and illuminating manner, but obviously much of it won't be new) and also for just the dryness of writing about military policy. Ricks' book is still probably the best military overview of the war — at least until 2006 — and its chief virtue is that his thorough slog through hundreds of interviews and thousands of pages of Pentagon and administration documents provides many official voices from the military establishment critical of our conduct of it. The best part of its criticism is that it's issued not from those philosophically opposed to warfare but those trained and practiced in how best to employ it.